Meditation is integral to many Buddhist practices, and it was during meditation that many Buddhists believe the original 'Buddha', Siddhartha Gautama, to have been enlightened. Mainstream Buddhist doctrine teaches that Siddhartha was a Prince who, upon leaving the confines of his Palace, became dismayed with the suffering he saw around him. Following this, he took it upon himself to bring an end to this suffering by following various spiritual paths. After experimenting with meditation and ascetism (the practice of deliberately undergoing suffering in order to better understand it) Siddhartha, exhausted yet still resolved to complete his task, sat under a Bodhi tree and meditated until he finally became 'Enlightened'. Though many Buddhist schools teach that rigid meditation practices, using specific positions and breathing techniques, is essential, Buddhism is by nature not a strict ritualistic practice. Buddhist meditation is part of an encompassing world view with everyday life as central to the experience of Enlightenment as meditation itself. Dukkha; or Suffering: Life consists of suffering, through birth, death, separation, want - all aspects of clinging or 'holding on' to aspects of life itself. Samudaya; the Origin of Suffering: The origin of suffering is desire of any nature. Desire must be let go of if suffering is to end. Nirodha; the Cessation of Suffering: It is possible to end suffering by following the Middle Way. 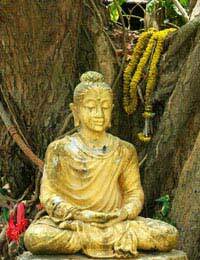 Magga; the Path to the Cessation of Suffering: The Middle way consists of the Noble Eightfold Path. If this path is followed suffering may be ended. The Eightfold Path is a system of behaviour which entails developing an awareness of one's real place in the world, and of one's transience, and therefore is a means of putting aside desire. For this reason Buddhism is a way of life rather than a system of ritual practices. Buddhism, as such, is not something merely practiced through meditation, although some more austere Buddhist's would emphasise the need to meditate in a much disciplined manner. The process of Enlightenment is something that can be carried with one daily; meditation is a means of further developing and enhancing that experience. Right View: A simple awareness of the Middle Way, the Four Noble Truths and the impermanence of life in all its aspects. Right Intention: Carrying with you at all times the intention to follow the Middle Way in all your actions. Right Speech: Speaking in a way that is clear and humble, and not making efforts to appear to have divine wisdom or special authority. Right speech must be reflective of one's awareness of their interconnectedness with all things and beings. Right Action: Actions must be carried out with the best intention towards all beings without desire or malice. Right Livelihood: Your livelihood (occupation) must be conducted without greed or desire and undertaken with an awareness of the Four Noble truths. Right Effort: Right effort entails the conscious willing to be aware of life as it really is, whilst not willing in such a way as to desire Enlightenment, for as soon as Enlightenment is desired it will become evasive. Right Mindfulness: An awareness of the tendency of the mind to distort reality with the addition of fanciful mental constructs, which often give way to desire. Right mindfulness is the act of perceiving reality as is, without distraction. Right Concentration: Right concentration is the principle of focusing fully on reality and having the mental will to perceive it without desire. Meditation is central to developing right concentration. The Eightfold Path is something which must be followed daily in all aspects of life. In light of this it can be seen that meditation, whilst being essential in developing the force of concentration and the sense humility necessary to Buddhist Enlightenment, is part of a much wider process. To look at this another way, it is possible to argue that meditation (or the faculties of mind developed during meditation) carries on beyond the simple sitting and breathing techniques that constitute meditation itself. Meditation is an ongoing process that colours and informs everything from banal everyday activity to moral decisions: The sense of impermanence and overcoming of desire learnt through meditation is intrinsic to Buddhist pacifist tendencies.These tendencies are not politically governed but, rather, develop out of a realisation of the Four Noble Truths. This is so with all aspects of Buddhist principle as meditation and everyday life inform one another.